Which makes me wonder “HOW DID HE DO IT!”, how he learned this well kept secret. If I don’t have joy, it seems I must not have learned something right just yet. Clearly all these years of my asking God to teach me, hasn’t yet reached the point where He has decided to teach me this particular truth. Wow, so If I want to have joy, I have to endure trials and Like It!? Hmm… Ok, maybe I don’t have to like it, but it does say I “must let endurance have its full effect”, if I am to be “mature and complete, lacking nothing”. So, I have to be patient (ouch), until the trials are complete, and by implication, I must NOT try to ESCAPE from the trials. Bummer, it is so much easier to run away than to stand. Well anyway, to end on positive note, I have noticed, that if I don’t react too quickly when I am depressed, that soon, the depression does go away and I DO REGAIN JOY!. So in the end, the solution is precisely, specifically and exclusively about waiting on the Lord, to accomplish his plan in His timing. I know the end will be great, and I am waiting.. How about you? The church I attend has been going though a lot of change lately. The CMA chapter I am president of has also been going though a lot of change in recent months including several people being ill. UCOA has also been going through a lot of change, like the moving to our new home in the Moose Lodge. COC and TMRA II have been joined by Texas Defenders, again lot of change. Good change, but change none the less. Of course there is one thing, or person really that doesn’t change. God is the same today as He was yesterday and as he will be tomorrow. He loves us just as much today and he cares about what is happening in our lives exactly as much as he did yesterday. More even than we can imagine. Of course all the changes in our lives sometimes make it hard to see and feel His love, but if we will pause for a moment and focus on him, he will take away the stresses that fill our lives, and replace them with a joy that surpasses all understanding. And if you think you are not good enough to know Him, just remember that He is perfect so we don’t have to be. We need only ask to know him, and he will come in. 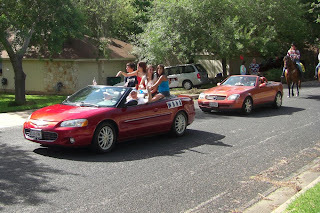 We walked to the Wells Branch 4Th of July parade, just down the block. 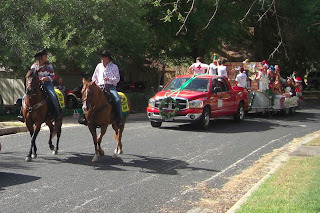 It was very quick this year, we actually missed the lead police cars because we were a couple of minutes late. Anyway, here are some pictures and my video of the event. Click any picture for a larger version. Click the title above for the video. 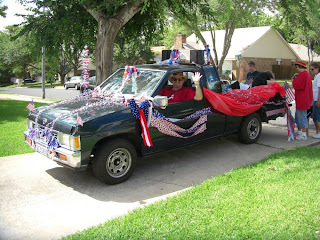 My neighbor Mark in his parade truck, complete with patriotic music! My granddaughters Chloe and Claire who are visiting from California. 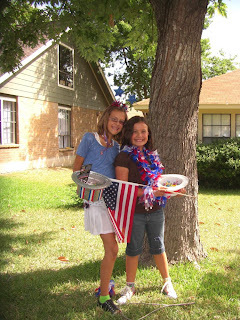 Their favorite part was collecting the candy being thrown from the parade floats. 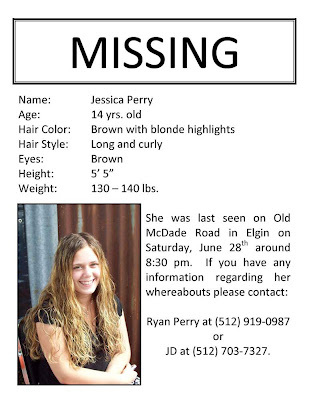 Click image for a larger version, If you have seen her, please call! UPDATE: She has been found, alive and well! !